It is already common knowledge that individual investors do not usually have the necessary resources and abilities to properly research an investment opportunity. As a result, most investors pick their illusory “winners” by making a superficial analysis and research that leads to poor performance on aggregate. Since stock returns aren’t usually symmetrically distributed and index returns are more affected by a few outlier stocks (i.e. the FAANG stocks dominating and driving S&P 500 Index’s returns in recent years), more than 50% of the constituents of the Standard and Poor’s 500 Index underperform the benchmark. Hence, if you randomly pick a stock, there is more than 50% chance that you’d fail to beat the market. At the same time, the 30 most favored S&P 500 stocks by the hedge funds monitored by Insider Monkey generated a return of 15.1% over the last 12 months (vs. 5.6% gain for SPY), with 53% of these stocks outperforming the benchmark. Of course, hedge funds do make wrong bets on some occasions and these get disproportionately publicized on financial media, but piggybacking their moves can beat the broader market on average. That’s why we are going to go over recent hedge fund activity in Lam Research Corporation (NASDAQ:LRCX). Is Lam Research Corporation (NASDAQ:LRCX) ready to rally soon? Not according to the smart money, which has sold off the chipmaker in droves during the past two quarters. In fact, LRCX was one of 10 Stocks Hedge Funds Ditched in Q3 Just Before the Market Crushed Them, which also left it a long way away from making the list of the 30 most popular stocks among hedge funds. Hedge funds’ reputation as shrewd investors has been tarnished in the last decade as their hedged returns couldn’t keep up with the unhedged returns of the market indices. Our research has shown that hedge funds’ small-cap stock picks managed to the beat the market by double digits annually between 1999 and 2016, but the margin of outperformance has been declining in recent years. Nevertheless, we were still able to identify in advance a select group of hedge fund holdings that outperformed the market by 18 percentage points since May 2014 through December 3, 2018 (see the details here). We were also able to identify in advance a select group of hedge fund holdings that underperformed the market by 10 percentage points annually between 2006 and 2017. Interestingly the margin of underperformance of these stocks has been increasing in recent years. Investors who are long the market and short these stocks would have returned more than 27% annually between 2015 and 2017. We have been tracking and sharing the list of these stocks since February 2017 in our quarterly newsletter. How have hedgies been trading Lam Research Corporation (NASDAQ:LRCX)? At Q3’s end, a total of 34 of the hedge funds tracked by Insider Monkey were long this stock, a 21% drop from the previous quarter. 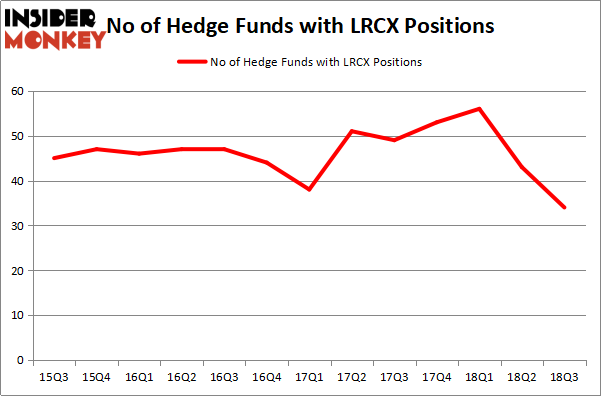 By comparison, 53 hedge funds held shares or bullish call options in LRCX heading into this year. With the smart money’s sentiment swirling, there exists a few key hedge fund managers who were adding to their holdings considerably (or already accumulated large positions). Among these funds, AQR Capital Management held the most valuable stake in Lam Research Corporation (NASDAQ:LRCX), which was worth $419.4 million at the end of the third quarter. On the second spot was Maverick Capital which amassed $242.9 million worth of shares. Moreover, Appaloosa Management LP, Renaissance Technologies, and Adage Capital Management were also bullish on Lam Research Corporation (NASDAQ:LRCX), allocating a large percentage of their portfolios to this stock. 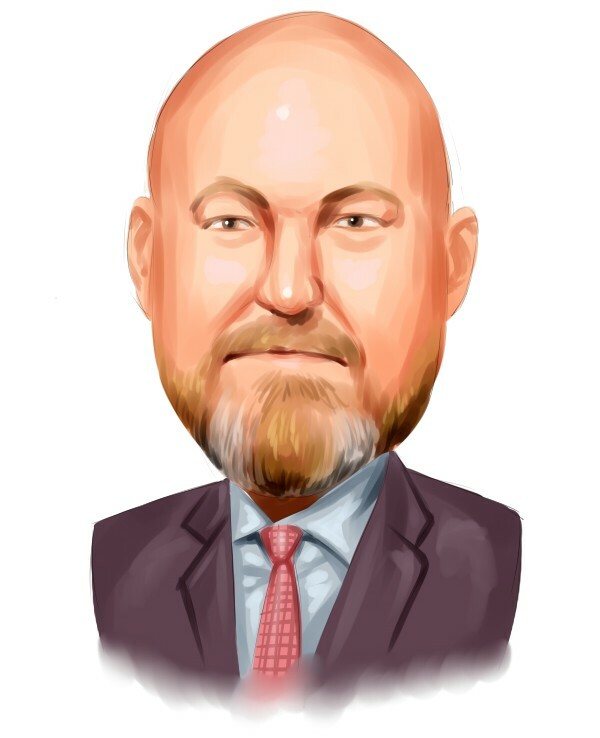 Judging by the fact that Lam Research Corporation (NASDAQ:LRCX) has witnessed declining sentiment from the entirety of the hedge funds we track, logic holds that there is a sect of money managers who sold off their full holdings heading into Q3. At the top of the heap, Zach Schreiber’s Point State Capital said goodbye to the biggest position of all the hedgies watched by Insider Monkey, valued at close to $78.8 million in stock, and Tony Chedraoui’s Tyrus Capital was right behind this move, as the fund said goodbye to about $20.4 million worth. These transactions are interesting, as total hedge fund interest dropped by 9 funds heading into Q3. Let’s go over hedge fund activity in other stocks similar to Lam Research Corporation (NASDAQ:LRCX). We will take a look at PACCAR Inc (NASDAQ:PCAR), Cummins Inc. (NYSE:CMI), PT Telekomunikasi Indonesia (NYSE:TLK), and PG&E Corporation (NYSE:PCG). All of these stocks’ market caps match LRCX’s market cap. As you can see these stocks had an average of 29 hedge funds with bullish positions and the average amount invested in these stocks was $1.42 billion. That figure was $1.57 billion in LRCX’s case. PG&E Corporation (NYSE:PCG) is the most popular stock in this table. On the other hand Perusahaan Perseroan (Persero) PT Telekomunikasi Indonesia Tbk (NYSE:TLK) is the least popular one with only 4 bullish hedge fund positions. Lam Research Corporation (NASDAQ:LRCX) is not the most popular stock in this group but hedge fund interest is still above average. This is a slightly positive signal but we’d rather spend our time researching stocks that hedge funds aren’t scrambling to get rid of, which doesn’t bode well for it in the near term.